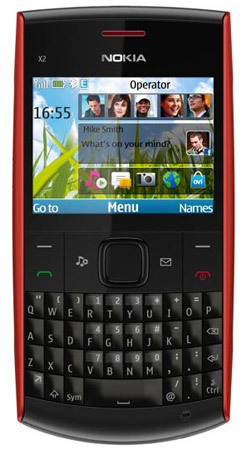 Nokia recently announced its new QWERTY phone Nokia X2-01. The device specially focuses on social networking and fast communications. It comes with a full QWERTY keypad. Nokia X2-01 comes with a 2.4 inch QVGA screen and a VGA camera. The device memory can be expanded upto 8GB with expandable memory slot. It also supports GPRS/EDGE. It must not be confused with the original Nokia X2-00. Nokia X2-00 has a 5 megapixel camera whereas Nokia X2-01 has only VGA camera. The users of this phone can see friendsâ€™ updates directly from the homescreen and easily post their own updates and photos. The device also has music features. Thereâ€™s one click access to music, the media player, FM radio and the Ovi Music service. Nokia X2-01 is expected to be available from this quarter and it will be priced at around Rs.4900. The design and features both are good according to the price of this phone. Holy smokes, Rs4900? I looooove this phone! For somebody who only wants a QWERTY board and mobile Internet in a phone, this is perfect. I remember the first Nokia phone I owned. It was a 5110. Back then, the LCD screen was still monochrome, but I loved its SMS-sending capability, Snake game, and the ever-reliable alarm clock. I seldom used it to place a call. Most of the time, my phone served as an accessory to show off my technological superiority. Yes, with its monochrome screen! Heck, it cost as much then as this phone does now! Who would have thought that in less than a decade, mobile phones would come this far this fast?